It’s National Craft Month and this year we’re celebrating with some serious blog inspiration. 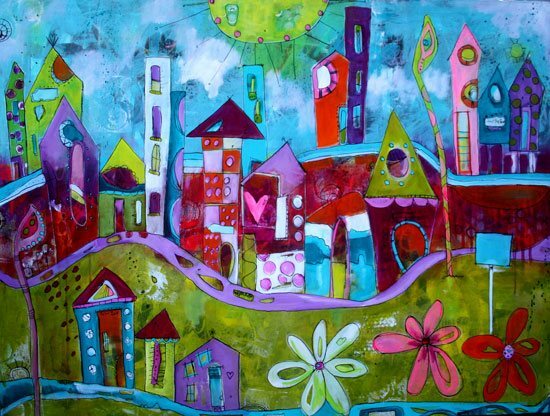 When asked what craft we would take to a desert island, we couldn’t pass up a chance to share Jodi Ohl’s list of island-approved mixed-media art supplies. Also, keep reading to check out all the other blogs in our blog hop this month! Over the years I’ve been asked several times, if I were stranded on a deserted island and could only bring a few art supplies, what would I bring? Seriously, just a few items? Could I not bring a box of tools? Admittedly my love for painting supplies knows no limits, with my collection of paints and assorted tools growing by the day to the point where my studio is about to burst at the seams. However, just like many of you, I do have my favorite tools and thought I’d share a few of them with you. Also, if you’re just getting started painting or if you’re wondering what you should bring to a painting class, this should have you covered! My preferred painting surface is stretched canvas. The smaller profiles are less expensive and great to practice on, but watch out for canvases that are covered in thin material, which could easily puncture. Canvas boards—don’t waste your money on them, they warp easily and need to be framed if you do create something you want to display long-term. Yes, I know most canvases are covered in gesso, or so they say. Gesso (affiliate link) is a primer that will give you a great ground to work on. 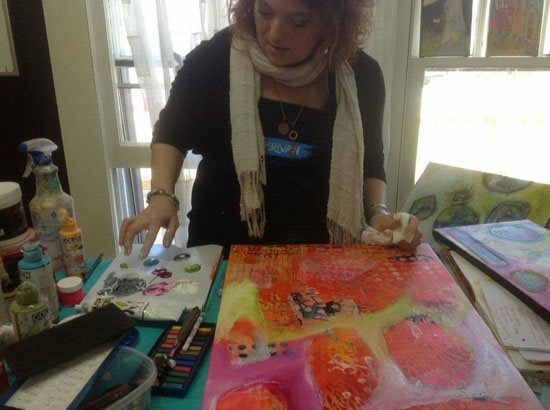 It creates a barrier layer between the fabric of your canvas and your paint. I find that my paintings are brighter or richer (with a colored gesso (affiliate link)) than if I just paint directly onto a canvas. 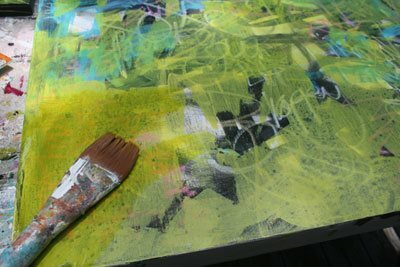 Gesso prevents the paint from seeping into the canvas, so you use less paint. It can also be a great first step of your textured layer. Since I paint in acrylics, I use glazing medium (affiliate link) a lot. It can be used in a couple of different ways: as a medium to keep your acrylics open longer (they won’t dry as quickly) and as a way to layer and create translucent paint without breaking down the pigments. Water can serve a similar purpose but will break down your paint and dry to a dull matte finish. Professional grade paint such as Golden, Matisse, and Liquitex (affiliate links) are all favorite brands of mine but they’re a bit pricey. Here’s what I say about that: You get what you pay for. These paints will give your paintings more depth of color and you actually use less paint because the pigment load is so high. I have students who lament the fact that they can’t get their paintings to be bright as mine, but these students are using the inexpensive craft paint. Not to say that some craft paint isn’t good quality, but it tends to be more matte and have a lesser quality pigment load in them. Think of it as a set of bed sheets. You can buy the $4.00 pillowcases that work, or you can buy the ones with 400-thread counts. They work, too, but you can feel and see the difference in the products. Use a variety of brushes that are mid-range in price for acrylic painting, such as this recommended beginner set (affiliate link). Stay away from the cheaper packages they will fall apart (bristle hairs in your painting) and not lend to smooth or precise strokes. I also encourage you to use a brush size that’s in proportion to the size of an area you’re trying to paint. For example, use a large flat or round brush for a large paintings or a background wash, then go down in size as you work on the details. A good brush makes a difference. Handmade items or items around the house, or island, work great (shells, leaves, combs, bubble wrap, old credit cards, skewers, etc. ), and so do commercial items such as stencils, stamps, or Catalyst blades (affiliate link). These are just some of the examples of what can help you achieve great mark making in your work. I love Neo-Color II crayons, Stabilo Pencils (affiliate links) in black and graphite, chalk, charcoal, woodless graphite pencils, and markers or pens by Pitt, Prismacolor, and Sharpie (to name a few). See—it’s hard to narrow down my favorites! Baby wipes (to clean hands, wipe away mistakes, wipe off brushes), soft gel medium, assorted papers, 3-sectioned water bucket (dirty, somewhat dirty, and clean water), hair dryer, apron, gloves (I don’t use them as much as I should), and lastly, a sense of adventure! This list should help get you started gathering supplies for your next painting adventure, whether it be on an island, at your home studio, or wherever your painting takes you! March 15 - Cloth Paper Scissors - You are here! Originally published September 5, 2014, updated and reposted on March 15, 2019.